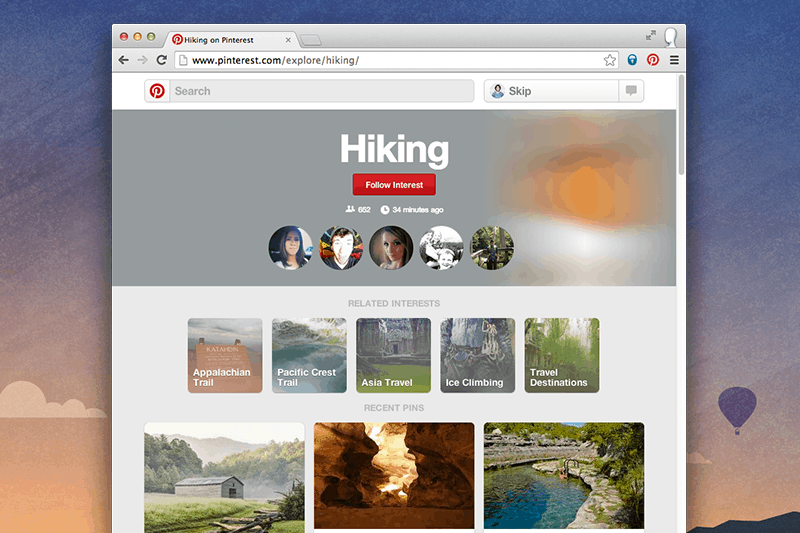 In an initiative to build out its discovery tools once again, the San Francisco-based virtual scrapbooking site, Pinterest announced on Thursday that now its users will be able to follow specific interests in addition to following other users. There already was an ‘categories’ tab on the site that offered users to search for pins by more general groupings, but now the users will also be able to subscribe to more specific interests in those categories. For instance, under the category ‘outdoors’ you can follow interest like running, hiking or camping. Once you follow an interest, all related pins will by themselves appear in your feed and that you need not bear the hassle of searching them. This new following option will allow users to find content even from people they don’t follow at present, which used to be a kind of challenge for this platform that has more than 30 billion pins. This new feature will be available to English users on Android, iOS (including iPad) and the web beginning Thursday. Although the rollout may not appear for all users right away but will soon be arriving, as announced by Pinterest on its blog.